What country is world renowned for tapas? But contrary to what American gastronomers charge you, a tapa is actually free. Not everywhere in Spain earns this reputation, however. In Barcelona, you generally don’t get anything with your drink. In Madrid, chips and olives are common although there are more tucked away local places which give you more homemade goodies that also level up every subsequent round. (We reveal our favs in our guide to vegan tapas in Madrid). In Granada though, generous tapas are the standard. There are even places that give you a tapa menu – to choose the free accompaniment with your drink. Often it’s almost a dozen choices. And if you go to the right places, you may not even bother ordering additional raciones (larger sharing plates that you pay for). That’s how much you can fill up – if you know where to go. Disclaimer: knowing where to go for vegan tapas in Granada is essential – you cannot just show up to any bar and expect them to have vegan tapas. This is because the free tapas are usually prepared in advance to expedite the process when the bar gets busy. Either they will have vegan tapas or not. We experienced first hand what asking for vegan tapas or raciones at a place that wasn’t familiar with veganism is like – lots of shooing away and impatience. And we can’t blame them. Tapas bars in Granada can get very busy, especially on the weekends. Knowing where to go for vegan tapas in Granada can make or break your experience! We’ve broken up this post into the three main neighborhoods you’ll likely go out for tapas in. 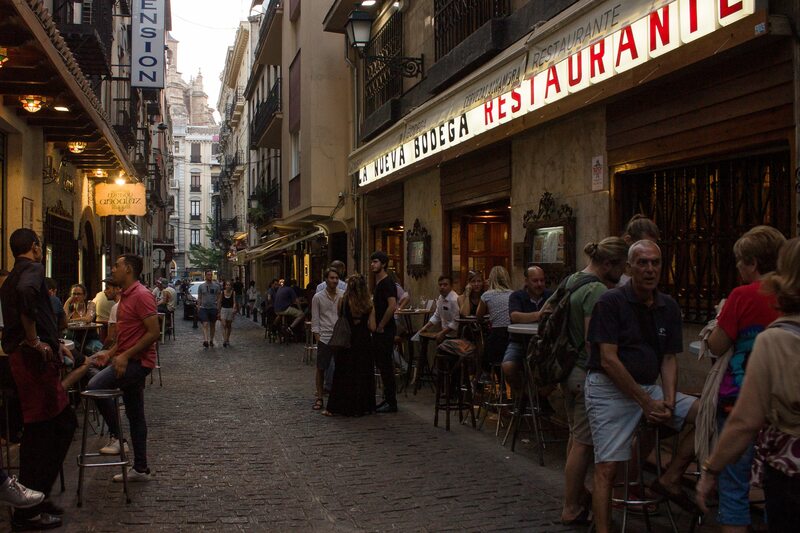 We recommend to sticking to one neighborhood per night so you’re not breaking up your tapas flow with a 30-minute walk between neighborhoods. Tapas time is generally between 9 pm – midnight on weekends but places may close earlier on weekdays. El Centro is probably where you’ll spend most of your time in Granada – when you’re not wandering the enchanting alleyways of the medieval Albayzín, that is. In El Centro, you’ll find Granada’s cathedral, Plaza Nuevo, and other famous sights. Easily our favorite spot for vegan tapas in Granada. El Ojú slings tapas like most spots in Granada – delicious food and generous portions. The key difference is that it’s all vegan! We went twice during a long weekend trip to Granada, that’s how much we loved it! Expect a punky vibe with a clean look rather than divey. They project movies on the weekend, (like the 1927 classic Metropolis) and play a very good mix of music, like MIA and chill electronic. The best vegan tapas spot in Granada, in our not so humble opinions. With 9 options to choose from, we wholeheartedly recommend the tortilla, the slider (la hamburguesita), and seitan sandwich (montadito de seitán) – the latter two are pictured in the photo below. Then if you have room, it’s your vegan obligation to try the rest. This tucked away local spot offers Brazilian inspired fare. The atmosphere was just our style – lots of locals, cozy interior and super chill. There is a regular carta that lists all the tapas you can order to accompany your drink, along with the option to order an extra for 1.50, and a ración for 5. The two vegetarian options listed, chickpea salad and Italian veggies, are also vegan and gluten-free! Both are delicious. We’d recommend sticking to your free tapa per drink, as the raciones don’t get much bigger for the price hike. This is the classic tapas street that every guidebook will tell you that you need to experience for tapas in Granada. If you’re traveling with friends, most likely they’ll want to experience the nightlife on Calle Elvira at least one night you’re in town. According to the couple we were house sitting for, this street used to be a total dump 15 years ago. The diveyness still remains in the alleyways snaking off of Calle Elvira. We got the local low-down from our house sitting hosts about this spot when we asked what places they knew with vegan tapas in Granada. A Los Buenos Chicos has a cozy woody interior with a generally chill vibe and a terrace outside with some tables. Don’t be surprised to see the bartenders hanging on the next door stoop when things are slow. There are two options for vegan tapas and they are gluten-free options as well. Raciones consist of larger portions of said tapas. This spot gets points for portion generosity even if their tapas weren’t ground-breaking. They have a vegetarian section with a few vegan options (not labeled but the bartenders know which ones are vegan). The salmorejo (a classic Andalusian tomato soup) and fajita are definitely vegan and came with a surprise side of potato. There are two locations, one on Calle Elvira and one on a side street coming off Calle Elvira near Plaza Nueva. We ate some of the most surprisingly good vegan tapas in Granada here. There’s a vegetarian section of the menu and vegan options are denoted with a V. We had the salmorejo, one of the best we’ve had, and the Thai peanut noodles, which were surprisingly spicy (for Spain). They have a large space and can easily accommodate groups. This divey vegetarian tapas bar is a local haunt. It’s also super tiny, so expect a crowd outside. Tapas come default to the discretion of the bartender – there is no menu. Just make sure to let them know you’re vegan. Each successive round brings a new tapa, so definitely stick around to extract maximum tapa enjoyment. Head to this place if you’re feeling something a little more trendy and spacious. Papaupa is a Latin American fusion restaurant with an extensive menu. Allergens are clearly marked and there are many vegan options. The food is high quality with prices to match. They will also give vegan tapas with your drink if you ask. We’ve been here twice and the options varied widely in portion but they were always tasty. Yuca fries that we ordered! There you have it – a short list for a small city. We strongly recommend doing your research before going out, unless you’re okay with only eating gazpacho and bread. Have any other places to recommend for vegan tapas in Granada? Leave your recommendations in the comments below! Pin Guide to Vegan Tapas in Granada! Veren is a filmmaker and creative pursuit enthusiast. Reared in California and cultivated in New York City, this blustering blogger is a formidable information source. In between bouts of substitute teaching, tutoring, mentoring and philosophizing, he house and pet sits while cooking for the Sam aka the girlfriend.